These lines, written by 15-year-old Antwon Rose Jr., speak to the trauma of relentless police violence and mass incarceration that weighs heavily on black and brown youth. On June 19, Black Lives Matter activists in Sacramento commenced eight days of civil disobedience, demanding accountability for the police murders of Stephon Clark and Brandon Smith earlier this year. That same evening in East Pittsburgh, PA, police stopped a jitney cab that matched a description related to an earlier shooting incident. Antwon Rose Jr.—now 17 years old, confused and afraid for his life—fled in panic from the passenger seat with his hands up. Without warning, the teen was brutally shot three times in the back by Officer Michael Rosfeld, sworn in to the East Pittsburgh Police Department just 90 minutes before. Like Clark, Smith, and so many other victims of racist police violence, Rose was unarmed and posed no threat to officers. Footage of the shooting, recorded by a nearby resident, went viral overnight. His murder has sparked daily protests and occupations, through heavy rain and intense heat. #Justice4Antwon (#J4A) has united black-led activist organizations, students, faith groups, socialists, and community members behind calls for justice, police and politician accountability, and an end to the racism that is deeply embedded at all levels of Allegheny County politics. Recitations of Antwon’s own words and the recurring chant “Three shots in the back: how do you justify that?” express the senselessness of a system that has ruthlessly devalued the lives and livelihoods of black people across the city and the country. Rose graduated from Woodland Hills High School, which has suffered the loss of five students to gun violence this year alone. Throughout the spring, students participated in walkouts, rallies, and trips to Harrisburg and Washington, D.C. In addition to calling on elected officials for gun reform and education funding, students have been vocal against police brutality and administrative abuse in schools. A community-wide campaign—led by the Alliance for Police Accountability (APA) and joined by State Representative Democratic Nominee, Democratic Socialists of America (DSA) member, and Woodland Hills graduate Summer Lee—has forced the Woodland Hills Superintendent to resign, and continues to demand that Woodland Hills School Board remove police officers from the district’s facilities. They also censured Democrat Stephen Zappala, the District Attorney of Allegheny County since 1998, for mishandling the investigation into the abuse. Zappala failed to bring criminal charges against Principal Kevin Murray and Officer Steve Shaulis for verbally and physically assaulting black students. However, one student was charged with resisting arrest, while another student with special needs faced a felony wiretapping charge after recording evidence of Murray’s abuse. The school-to-prison pipeline under Zappala is reflective of a dramatic rise in local mass incarceration under his tenure. Although crime has decreased, countywide incarceration has risen by 70% over the past two decades, while black males account for 49% of the Allegheny County Jail population. The DA’s office also has a history of incomplete investigations into police brutality; it came as no surprise that Zappala refrained from immediately charging Rosfeld, despite clear video evidence of unjust deadly force. For all these reasons, #J4A has taken special aim at Zappala. 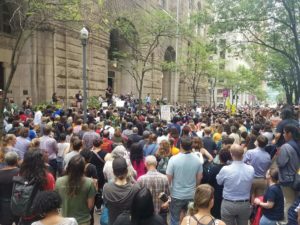 Brandi Fisher of APA called out the injustice of the entire system before thousands gathered at a June 22 rally in Downtown Pittsburgh: “This is about money. They’re profiting off our bodies like they did in slavery… We’re here to put Zappala on notice.” These mass demonstrations undoubtedly pressured the DA to ultimately charge Officer Rosfeld with criminal homicide. One of the most egregious discoveries surrounding this case is Officer Rosfeld’s own record of misconduct. Prior to being sworn in by East Pittsburgh Police, Rosfeld was fired by University of Pittsburgh Police for excessive force and filing false reports that were contradicted by surveillance footage. In his initial reports of the traffic stop that led to Rose’s homicide, he claimed that the unarmed teen turned toward him holding something that resembled a weapon. This, too, was completely discredited by video evidence. It is clear that Rosfeld posed a threat to the community he was relocated to, and should have never been hired by East Pittsburgh police. Nevertheless, Senior District Judge Regis Welsh released Rosfeld on unsecured bond—a decision that remains uncontested by Zappala. Furthermore, Zappala acknowledged that county police departments like East Pittsburgh’s have no policies or procedures for such fatal incidents, meaning that the borough cannot be held legally responsible for Rosfeld’s actions. Outraged by the hypocrisy that a killer cop did not have to post bail money, the #J4A movement continues to protest, demanding a higher bond be set, while organizing towards next steps for racial justice and equality. Leaders of the #J4A movement, including Brandi Fisher and Summer Lee, have promoted the need for new officials to take on this broken system. Leon Ford, who was shot and paralyzed by Pittsburgh Police during a traffic stop in 2012, has joined this call: “We need to elect new leaders who will push for accountability and consequences in police shootings… We must engage the justice system at all levels if we ever hope to position ourselves for change.” On July 2, public defender Turahn Jenkins announced his challenge to Zappala in the 2019 Democratic Primary for District Attorney. Early support for his campaign mirrors the #J4A movement’s hunger for long-term solutions to routine injustices. As with the election of District Attorney Larry Krasner in Philadelphia, a more progressive DA committed to reversing mass incarceration and prosecuting racist police would be a step forward. Unfortunately, mere days after the campaign launch, Jenkins stated before local LGBTQIA+ community leaders that he believes being gay or trans is a sin. In the wake of this, potential supporters and #J4A activists have rightfully questioned his ability to protect LGBTQIA+ people against discrimination and abuse by law enforcement; such beliefs, especially when held by an elected official, will only lead to further intolerance and open violence against the community. 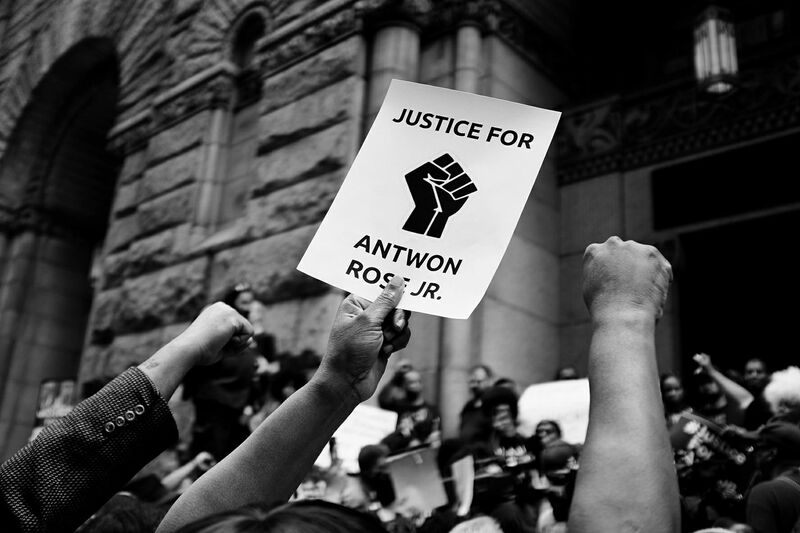 These revelations underscore the the primacy of building a strong movement–rooted in social justice, labor, and socialist organizations, students, and community groups–to fight for all working and oppressed people, and to win justice for Antwon and all victims of police violence. It also demonstrates the importance of creating political organizations with democratic mechanisms to ensure our candidates and officials are accountable to an agreed upon platform. Such a broad organization should convene to democratically propose and select candidates who can represent and amplify the demands of the movement. Racism and all other forms of oppression pervade our judicial and education systems, housing, and workplaces; eliminating these injustices requires uniting various grassroots struggles to strive and strategize together for social and economic justice. Capitalism has relied upon racism and other forms of oppression to maintain the economic and political dominance, depriving millions in America of the basic necessities to live, and even their lives. The rise of the Trump administration has meant increased profits for wealthy individuals and corporations amidst emboldened white supremacy and redoubled law and order policies. Pittsburgh’s Democratic city establishment under Mayor Bill Peduto poses itself against Trump’s racist policies. Yet, the Democratic Party has dominated Pittsburgh politics for decades. It has overseen police violence, rapid gentrification, and the continued displacement of black residents, many of whom have been forced to relocate to boroughs like East Pittsburgh—which, as Peduto was quick to clarify in a tone-deaf deflection of responsibility, is not under City authority. Recently, hundreds of Penn Plaza residents were displaced. Just this month, the Housing Authority voted to demolish Bedford Dwellings, the city’s second largest public housing complex—referred to by DA Zappala as a “nuisance property.” These racist policies are compounded by a black unemployment rate of 16%, while 34% live below the poverty level, while community members are criminalized and abused in their neighborhoods and schools, as Antwon Rose Jr. witnessed at Woodland Hills. #J4A has shut down highways, bridges, and major intersections for hours throughout the Pittsburgh area. These daily actions have mobilized thousands against racism and police brutality, and have successfully pressured Zappala to charge Rosfeld with criminal homicide. Further demonstrations and nonviolent civil disobedience will be essential to securing a conviction and justice for Antwon Rose Jr. and his family. The continued pressure of an organized mass movement can also win such demands as the removal of police from schools and the creation of a countywide civilian oversight board, with real powers over the Allegheny County police departments, including setting policy, amending budgets, launching independent investigations, setting department priorities, and with the right to subpoena officers. It has already compelled Allegheny County Council to vote 8-6 to begin the process of creating such a board; but the fight must continue for one that is fully comprised of members democratically elected by voters. Further still, such a movement can stop mass evictions and the privatization of public housing; it can win higher wages, and funding for our schools and infrastructure. Democratic socialist State Representative nominees Summer Lee and Sara Innamorato have a significant role to play in building such a coalition behind a socialist platform for economic and racial justice. Indict, prosecute, and convict killer cops! Black homes matter. Housing justice for all!